Some men must be found. Haunted by the nightmares of killing he experienced in Kosovo in the past, Aaron Hallam, has turned into a top special-forces assassin ... gone renegade. And when game hunters in the Pacific Northwest are being targeted and viciously slain, the FBI realizes that the indiscriminate murders are the work of no ordinary thrill killer. They turn to the one man who can track Hallam down and bring him in - skilled former warfare instructor L.T. Bonham. Bonham is grimly familiar with the killer's deadly techniques - he personally trained Hallam, his most skilled student. Now the seasoned teacher must engage his talented pupil in a deadly game of cat-and-mouse, with a playing field that moves from Oregon's rural wilderness to the concrete jungle of the city. Watch this and discover why some men must be found. $13.482 million on 2516 screens. William Friedkin and company have given Rambo a 21st century update in 2003’s The Hunted. It’s a nightmare scenario where a Special Ops assassin (who now seems to be working for PETA) flips out and decides that it’s time to go on a killing spree without a really good reason to justify it. 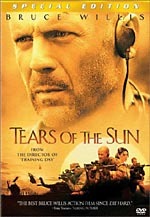 The film starts out by transporting us back to 1999 in Kosovo and the Serbian army is in a particularly cruel mood, as they are wiping out some nondescript city. It’s here that Aaron Hallam (Benicio Del Toro) is serving with an Army Special Forces Unit that is attempting to halt the senseless slaughter of the ethnic Albanians by Serbian armed forces. 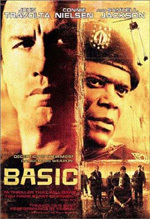 Hallam’s assignment is quite simple – kill the commander of the Serbian Army by any means necessary. Hallam is able to complete his mission with brutal efficiency, but after seeing a multitude of civilians gunned down before his eyes, you know that somehow, this event is going to come back to haunt him. You see, although he’s a ruthless executioner himself, in Hallam’s mind, killing a worthless piece of human garbage like the Serbian commander is a necessary evil and he’s just God’s instrument on earth. However, when innocents are brought into the mix, Hallam manages to feel remorse and sorrow. As times passes, the trauma from Kosovo never fades and the horrors of that particular mission are constantly on his mind. Very quickly we’re taken to present day British Columbia and it’s there that we meet L.T. Bonham (Tommy Lee Jones), a retired “survival” and “tracking” teacher for the United States government who now works for more lofty environmental causes and he’s living somewhat of a reclusive life. Seems that Bonham’s former profession had him training remorseless Special Forces killers for Uncle Sam and one of his former star pupils was the aforementioned Aaron Hallam. Bonham is quickly drawn back in to working for the government when his former student decides to go on a killing spree deep in the woods of the Northwest. It’s assumed that Hallam can’t discern between his former military missions and reality and he has simply gone off the deep end, operating completely on his most base, animalistic instincts. From what we can gather about the killings, it appears that Hallam doesn’t necessarily care for hunters. He takes issue with them stalking their prey with their big scopes and even bigger rifles and for that “sin”, Hallam decides that he’ll slice ‘em up and teach ‘em a lesson that they’ll never forget. Forget the fact that what the hunters are doing is perfectly legal and simply buy right in to Friedkin’s “guns and hunters are bad” theme and you’ll be just fine … Hallam actually has a reason for his rampage, but it’s ridiculously and unintentionally hilarious. FBI agent Abby Durrell (Connie Nielsen) brings in Bonham to help out in finding Hallam and from there on out, The Hunted simply turns into a series of chases, arrests, escapes, and near misses and it all builds toward a final, climactic showdown between teacher and student. In places, The Hunted features William Friedkin at his best (directing tight and efficient fights/chases and using the particular location/setting to its fullest while shooting said fight/chase), there are moments where he seems to be dragging the bottom of the proverbial barrel of cheap gimmicks (for example, there’s a fight sequence where one of the characters takes a scoop of his own blood and throws it in the other’s face as a distraction). Even so, Friedkin never lets us forget that he’s still a Hollywood pro that knows how to entertain his viewers. And although The Hunted doesn’t come close to transcending its genre like The Exorcist or The French Connection did, it’s still a decent effort from a magnificent director. There’s really not much to The Hunted when boiled down to its base elements – the explanations given for the featured rampage are vague and ambiguous (and silly) and all we’re really left with is the thrill of the chase. However, in the case of The Hunted, the chase in and of itself is a pretty fun ride. Rather than trying to impress us with a heaping of special effects and CGI, the film features men in conflict at their most primal – one-on-one, man-to-man – and Friedkin manages to present it with enough grittiness and edginess that it holds our interest. Flawed in spots to be sure, The Hunted was a nice enough change of pace that it comes with my recommendation. Paramount brings The Hunted to the home viewing market in the film’s original theatrical aspect ratio of 1.85:1 with anamorphic enhancement. (A fullscreen version is also available, so be sure to pick up the correct one on the day it streets.) The studio has really picked up the pace when it comes to putting out consistently fine looking video transfers of late and The Hunted is simply another entry in a long line of winners from the studio. Friedkin and cinematographer Caleb Deschanel have employed some really nice tweaks to the image to make The Hunted more than just a standard-fare action flick and the results come across impressively in Paramount’s DVD transfer. Deschanel’s earthy cinematography looks very crisp and sharp, with a natural color palette that was properly balanced and saturated at all times. From the dark and war torn streets of Kosovo to the primordial Northwestern forests to the concrete jungles of Portland, we get a multitude of settings that were consistently detailed and brusque. The film was very shifty, with a multitude of palettes, but Paramount handles it all in stride and their transfer rarely faltered. Black levels were solid, fleshtones were natural, and The Hunted had few concerns noted throughout. Flaws were of the run of the mill variety, as some non-distracting grain and some slight shimmer was noted in a couple of areas. Edge enhancement was hardly an issue, as were flakes and flecks on the print and fans of The Hunted have every reason to be excited with Paramount’s transfer. The studio has also given The Hunted a really nice Dolby Digital 5.1 audio transfer that fits the material at hand quite well. It was a surprisingly active mix that activated your surrounds at just the right moments without seeming overdone or gratuitous. From the opening sequences in Kosovo to the deep Northwestern woods and beyond, Paramount has really given your surrounds a good bit to do. While the opening battle scene in Kosovo is quite impressive - with its whizzing bullets and booming explosions - probably one of the more notable moments in the film is when Hallam taunts his “prey” while hiding out in the woods. His voice eerily rings out throughout your living space and you feel that he’s actually in the room with you – taunting you and hiding behind various non-descript pieces of furniture - waiting for just the right moment to jump out and gut you like a fish. Rear surrounds were quite active as well, as basic environmental effects were very lively and engaging many times throughout the film, allowing for a very ambient and immersive experience. All of the effects heard were natural, crisp, and distinct at all times and The Hunted was presented with excellent dynamics and range throughout. 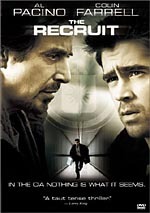 Dialogue was firmly anchored in the center channel, but did exhibit some nice panning and separation from time to time. It was all very clear and intelligible, without any harshness or edginess noted. Brian Tyler’s very contemporary score received nice treatment in Paramount’s track as well and came across as very rich and full at all times. The .1 LFE channel remained fairly active and was obviously most notable during the more active sequences in the film. The studio has also included an English Dolby Surround mix, a 5.1 mix in French, and English subtitles. There are a decent amount of supplements to check out on The Hunted, with the most impressive addition to the roster being an Audio Commentary with director William Friedkin. As usual, the director provides a very engaging discussion about his work, as well as his methods, and he does so in a way that’s easily understood by the most simplistic of viewers. He gives an interesting and engaging discussion on The Hunted, as well as some really nice insight on his improvisational and guerilla-like methods for making movies. While Friedkin covers more general topics like working with the actors in the film, shooting on location, and the like, he still manages to make it interesting every step of the way. This was a really engaging commentary and it shouldn’t be missed by those who consider themselves fans of the film, or simply fans of the director himself. Under the main heading of Documentaries, we get four individual featurettes that tend to gloss over the particular subject they are covering/featuring. 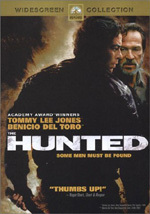 First up is Pursuing The Hunted (8:06) and here, director William Friedkin discusses his inspiration for the film, while actors Benicio Del Toro and Tommy Lee Jones discuss their characters and how they see them in the overall scheme of the film/story. It’s all very high level and while interesting, it’s simply too short to be completely enthralling. Pursuing is followed by Filming The Hunted (9:28) and here, Friedkin and cinematographer Caleb Deschanel discuss the documentary style “look and feel” of The Hunted and how it was accomplished. The opening Kosovo sequence and its execution, as well as its realistic set, is discussed in great length as well. The last two supplements here are Tracking The Hunted (4:17) and The Cutting Edge (8:40). Tracking gives us a quick introduction to Tom Brown, technical advisor for The Hunted and real life tracker/survivalist – someone you’d definitely want on your side if the proverbial crap ever hit the fan. He also gives us a nice discussion on how certain real world techniques were adapted for use in the film. Edge shows us how certain fight sequences and stunts were set up and performed. The knife fights are the main concentration of the feature and we hear from experts in the field who served as choreographers for the fights. Next up are six Deleted Scenes (“FBI Sting Section”, “Chenoweth Arrives At Zander’s”, “Bonham Climbs Tree”, “Van Zandt Says Hallam’s Gone”, “Bible Reading And Loretta’s Bedtime”, and “Rock Trap In The Woods”) that taken as a whole, wouldn’t have done too much for the film one way or the other. Their exclusion is no big loss, but it’s nice to have them here to view on DVD if and when we feel like it. Paramount has also included a handy –PLAY ALL- for the scenes as well. In total, the scenes run for 9:46. Finishing off the disc is the film’s Theatrical Trailer, as well as Previews for other Paramount offerings Timeline, The Core, and The Indiana Jones Collection. I know I’m playing right into Hollywood’s hand by simply telling viewers to overlook the more ridiculous elements of The Hunted and enjoy it for some of the “cool” fights and chases … but for whatever reason, those elements alone were enough to hold my interest. The film is far from a masterpiece, but it merits a look – at least a rental - in my opinion. As far as the DVD goes - fuggedaboudit - Paramount has given fans a great way to enjoy the film at home with a really nice package all the way around. While the set is lacking somewhat in the extras category, The Hunted contains pretty sweet transfers in the audio and video areas that should pacify the vast majority of potential owners. Worth a weekend rental for sure, but hard to recommend site unseen, The Hunted is a really nice addition to Paramount’s already impressive stable of titles.